Al Pacino might DECK ME for this! Let’s just get one thing straight. The “Godfather” was the best move ever made. I suppose you could disagree with me, but what could possibly be better than the first “Godfather”? Not many movies even come close. Anyway, as you know, pretty much any time Hollywood dips its toe into the move sequel waters, they muck it up. There was “Basic Instinct 2″ (a huge bomb), “Grease 2″ (another bomb), “More American Graffiti” (it stunk up the place), “Speed 2″ (a colossal failure) and a host of other movies whose sequels couldn’t match up to the original, including “Godfather” 2 and 3. 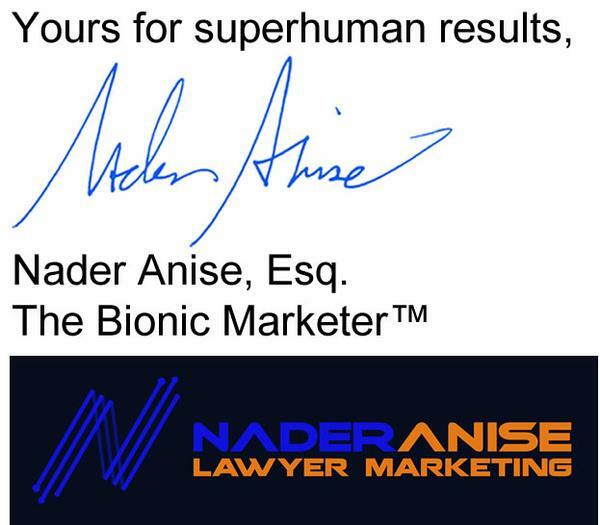 But here at the “Superhuman Results” legal marketing newsletter, you’ll be happy to know that our sequels are just as good as (if not better than) the original. Here are some of my best marketing quotes (part 2). If you’d like to get them straight to your cell phone, just go to www.naderanise.com and subcribe. 8. “If you could read your clients’ minds, do you know what they would say? ‘I AM THE MOST IMPORTANT PERSON IN THE WORLD (caps on)!’” Don’t ever forget that. Feel free to pass these along or comment. If you’d like to receive my newest marketing quotes directly to your cell phone (don’t worry — I would NEVER abuse the privilege and don’t spam) just sign up for free at: naderanise.com. Msg&data rates may apply. To unsubscribe, text STOP to 313131 (393939 in Canada). For help text HELP anytime. Available in USA & Canada. Up to 12 msg/mo. Your privacy is always protected and your information will not be shared. © Copyright Nader Anise Lawyer Marketing 1999-2014. All Rights Reserved. ANY EARNINGS, INCOME OR PROFIT STATEMENTS MADE BY ANY ATTORNEY ON THIS WEBSITE IS UNIQUE TO THAT ATTORNEY. THERE IS NO ASSURANCE OR GUARANTEE BEING MADE THAT YOU WILL ACHIEVE THE SAME RESULTS. ANY PRIOR SUCCESSES OR PAST RESULTS SHOULD NOT BE USED AS AN INDICATION OF YOUR FUTURE SUCCESS, RESULTS OR INCOME.